Dark Social is a huge problem for marketers worldwide. If you don’t already have a strategy to deal with it, you’ll definitely want to work on one. In a nutshell, Dark Social refers to the act of sharing content over private channels like Facebook Messenger, WhatsApp and email. If you’re wondering why Dark Social is problematic, it’s because links shared through these channels aren’t traceable by web analytics tools since they don’t carry any referrer data such as tags or UTM parameters indicating the source of the click. As a result, marketers and PR professionals are unable to accurately track the traffic and conversions generated via Dark Social. If you factor in that public engagement levels are decreasing on most major social networks – Instagram being the exception – and that many people are spending much more time communicating with friends and family via private messages across social platforms, you end up with a dangerous mix. Here’s the backstory: the term “Dark Social” was coined by Alexis Madrigal of The Atlantic in 2012. As Madrigal puts it, we’re only seeing and measuring the “tip of the sharing iceberg”. And the worrying part? Dark Social has grown immensely over the last few years. In 2014, Dark Social accounted for between 59% to 77% of online traffic. Just two years later, Dark Social contributed to a whopping 84% of online traffic. How does Dark Social impact communications and marketing? The primary way in which Dark Social impacts the communications and marketing world is that it skews PR professionals’ perceptions and hinders our attempt to optimise our PR and marketing activities. Consider this: if 84% of online traffic is generated by Dark Social, this means we’re only seeing 26% of what’s going on. Running in the same vein, that would also mean we’re spending all our PR and advertising budget based on 26% of what’s actually happening. Obviously, this isn’t an ideal scenario; we might invest in the wrong channels, thinking they’re more effective than they really are. On top of that, it’s also problematic when PR professionals and marketers aren’t able to listen in on the conversations that are being generated about their clients’ brands. Why is this the case? Well, this makes it tough for us to identify trends, as well as learn what type of content and/or message resonates the best with our audience. Again, this undermines our PR and marketing efforts and diminishes the effectiveness of said efforts. The one largest challenge that brands and PR professionals face with Dark Social is that, as an industry, we aren’t taking it seriously. According to a survey of over 1,200 brand marketers, only 4% of respondents regard dark social as one of their top three challenges. Florian Alt – Senior Director, global brand communications at Adidas – is one of the exceptions by recognising the issue already back in 2016 saying that ‘dark social carries 70% of global brand referrals‘. And while most marketers and PR professionals underestimate the complexity and the scale of Dark Social, there are some who are completely unaware that Dark Social exists. The good news? Once you understand the problematic nature of Dark Social and commit yourself to come up with a Dark Social strategy, you’ll find that there are plenty of tools that you can use to streamline the process. More on this in a bit! Why is tackling Dark Social especially important in 2018? Dark Social has been around for years now, so why is tackling it especially important in 2018? Well, we previously mentioned that Dark Social accounted for 84% of online traffic in 2016, but since then, it’s grown even more. 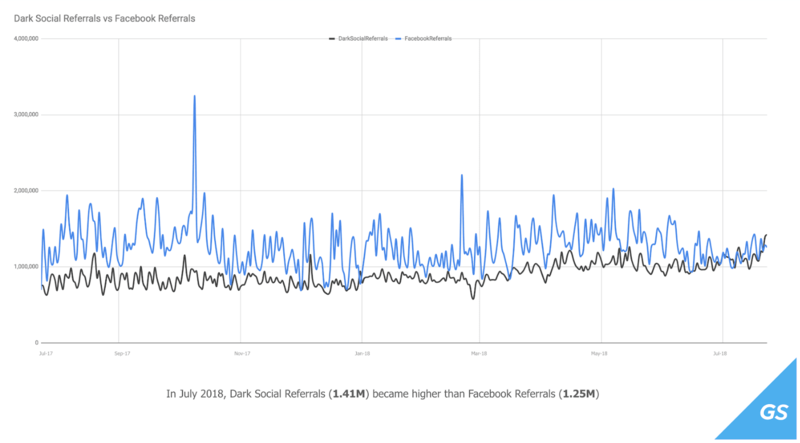 In July 2018, Dark Social actually took over Facebook and became the largest referral traffic source. At the same time, brands and companies are placing more importance than ever on social attribution. If you’re spending big bucks on a social campaign, then you’ll need to prove that your campaign generates traffic and results — simple as that. Bearing this in mind, tracking your referral traffic accurately and separating your Dark Social traffic from the other traffic you earn, is a must. To do this, head over to GetSocial’s Dark Social Calculator and log in using your Google Analytics Account. You’ll be able to use this tool to analyse your total estimated Dark Social traffic, as well as your top pages affected by it. Once you’ve done that, bookmark the calculator so that you can check in for a second estimate, one month after you’ve implemented your Dark Social strategy. This way, you can benchmark your results and see how far you’ve come! If you’ve got sharing buttons on your site, this allows you to track all the instances where your visitors share your content. Make sure that your buttons come with UTM parameters so that your shares show up in Google Analytics. Sharing button tools include ShareThis, Shareaholic, and Sharexy. Sharing buttons aside, there are plenty of other social tracking tools that you can use to reduce your amount of Dark Social traffic. One of the most popular tools is Po.st, which allows you to include a Linkback URL on any content that has been copied and pasted from your site. How does this work? Say someone’s reading an article on your site and they copy a paragraph and paste it into a Facebook Messenger conversation with a friend. Po.st will automatically include a one-liner below the copied text that says “Read more at http://yourwebsitehere.com”; this allows the receiver of the message to click on the URL and navigate to your website. So far, we’ve been talking about how you can lessen your traffic from Dark Social and encourage your users to access your website in a way that allows you to track them. To cover all your bases, you can also supplement your effort with another strategy – and that is to embrace Dark Social and proactively engage with your audience via Dark Social. How do you do this? Simple — create a Facebook Messenger, Whatsapp or Line group so that your brand can connect with its followers. If you’ve got the budget to do so, you might want to get some influencers or micro-influencers on board. This will help you generate buzz and get more followers to join the group. Additionally, you can also run ads on dark social for example on Facebook Messenger or via AdWords on Gmail – another dark social channel. When you’re interacting with consumers on Dark Social, the expectation is that you’ll engage them on a deeper, more personal level. Bearing this in mind, you should either create or curate content that’s specific to this group of consumers. Don’t just re-use a standard set of branded messages from your existing campaigns; this will probably turn your consumers off. Many brands make the mistake of treating their Facebook Messenger or Whatsapp Group like a Facebook Page and using it to broadcast messages. Here’s the thing: if your consumers are simply looking for product updates and information on promotions, they could have joined your mailing list. Instead of making it all about your brand and pushing out your messages to your consumers, be sure to engage in personalised two-way conversations and interact with them. Finally, your consumers aren’t joining your Facebook Messenger or Whatsapp Group because they want a sales pitch, so don’t be too aggressive in promoting your products. Instead, give your consumers behind the scenes access, offer them exclusive previews and serve them with relevant content that allows them to get more value out of your product. If IKEA were to jump on the Facebook Messenger bandwagon, for example, they could send their followers links on home DIY projects and creative IKEA products hacks, instead of simply promoting their products and sale events. An example of a brand that’s tackled Dark Social head-on is Adidas. Back in 2016, the company launched their “Tango Squad” initiative and started building communities of “highly connected football fans and influencers”. Here’s how it works: Adidas creates exclusive content with its influencers and shares sneak previews of new products with them. These influencers then distribute the content from Adidas to their networks via Dark Social platforms. You know what they say: if you can’t beat ‘em, join ‘em. Adidas aside, there’s also HiSmile, a teeth-whitening products company which makes use of Facebook Messenger ads to reach out to their consumers on Dark Social. More specifically, HiSmile runs sponsored messages in Facebook Messenger to re-engage their existing customers, hitting them up with promocodes in order to incentivize a repurchase. All in all, HiSmile’s campaigns generate a 9.92x return on ad spend, and it also decreases their Cost Per Purchase by 11x and increases their Click Through Rate by 21x. The future of Dark Social: where does it go from here? There’s no denying that we now have more tools to help us curb the growth of Dark Social than ever. That said, the number of messaging app users worldwide is on the rise; 1.58 billion users utilised these apps in 2016, but this number is projected to grow to 2.48 billion users by 2021. Dark Social is definitely here to stay, so PR pros should start familiarising themselves with strategies on how to reduce Dark Social traffic and at the same time learn how to tap on Dark Social for their brands’ benefit. Robin Shaw, Co-founder of consultancy Warm Street, puts it like this: ‘When agencies get their hands on dark social channels the data within it will be a game-changer; it shows consumers’ real interests and is incredibly valuable‘.